As semi-truck crash lawyers, we carefully investigate collisions on behalf of those injured by trucking companies and their drivers. 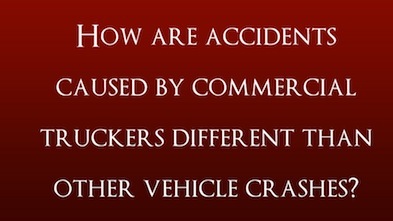 Semi truck crashes are different from car crashes in several ways. Semi truck companies and semi truck drivers must comply with road rules that are different, and stricter, than the rules applying to passenger car drivers. There are many regulations that govern the use of a semi truck, including loading requirements and the amount of time that drivers are allowed to operate a semi within certain time periods. We look for evidence that the company or driver failed to follow these laws and regulations, which helps us prove their fault and obtain full compensation for you. Prompt and extensive investigation is critically important in semi-trailer accident cases. We need to examine the vehicles and the accident scene to track down information about possible truck driver error, improper loading, equipment failure, and other possible causes of the trailer collision. Every aspect must be thoroughly investigated. Without sufficient proof, those responsible may escape liability for the injuries they caused. At every step of the way, our goal is to maximize the compensation you receive by holding those responsible accountable for the injuries you’ve suffered. Choosing a lawyer to help with a personal injury claim is a serious act. We offer free consultations so you can visit our office, meet our legal team and receive preliminary information about how we would approach your case. To schedule a private consultation, call toll free 520-293-5300. Or, use our easy online Contact Form to make an appointment. Frances has always treated me like family and whenever I hear of someone in need of legal representation I always refer them to her without hesitation. Her knowledge of the law coupled with her caring attitude and ability to make anyone feel comfortable is the perfect combination for a personal injuries attorney. The last thing anyone wants to deal with after a traumatic accident is an insurance company and with Frances, you never have to worry. She is the best and more importantly, she truly cares about her clients well being.